How to avoid purchasing a flood car. The last thing you want to happen when you purchase a used car is to find out after the fact that you bought one that was flooded. This can occur when a car has been through a major catastrophe, such as a hurricane, and has been sent to the salvage yard, then purchased and cleaned for resale. 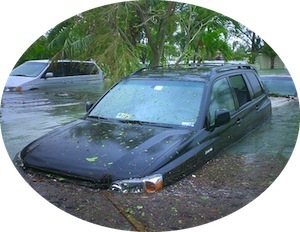 A so-called “flood car” should indicate that damage on its title. That said, it is not too difficult for unscrupulous people to buy these cars, fix them and have a new title issued, often in states far away from the damage. You can search for telltale signs of a flooded car and avoid buying a lemon car. Let your senses tell you if something is wrong with a car. Musty smells can be detected in the cabin, trunk or engine bay. There may also be an unmistakable perfume or cleaning solution smell. That smell alone should tell you that something is not right. Why else would a seller try to use a cleaning solution or perfume in a car he is trying to sell? Flood-damaged cars usually have new carpeting. If the carpeting feels too new compared to the age of the car, your suspicions should be raised. If the carpet has not been replaced, run your hands over it to look for signs of staining and fading. A carpet that has been soaked just doesn’t feel right either — the pile can feel rough. Use the same testing methods for the upholstery too. Flip the rear seats over, move the front seats back and forth, and peel away the carpeting. Look closely at the bolts and seat runners — if these appear rusty, then the car has been water-damaged. Check the tire well, storage compartments and door pockets for signs of water. Staining and residual matter could be present — what the seller may have missed when detailing the car. Damage to your car’s electrical system may be more difficult to see, but if all of the wires beneath the dashboard are new, then is it quite likely the car has been damaged. Replacing wires won’t mask worse problems such as salt water in the engine, in the transmission or in other components. New carpeting in the trunk, a new jack for the spare tire or anything else that doesn’t match with the rest of the trunk should be a warning sign. Check the gasket around the trunk as well as the hood — it could be brittle or new if the current owner has replaced it. Wiring in the tail lamps might also be damaged. Look up and within the trunk lid for signs of rust, discoloration and foul odors. You can track your vehicle’s history by obtaining a CARFAX vehicle history report or by visiting the National Insurance Crime Bureau and using its VinCheck service to find out whether a car has been declared an unrecovered stolen or salvage vehicle. Most importantly, hire a trusted mechanic to inspect your car. He may turn up things you missed or didn’t think to inspect, as well as information not included in the vehicle history report. History reports are a tool, but they don’t tell you everything. (Here is an excellent article that details the limits and sometimes the pitfalls with vehicle history reports — Limitations and Problems with Carfax or any Vehicle History Report). Disclaimer: This writer is a contributor to the CARFAX website. He receives no remuneration for this article from CARFAX or any other company.